SpiteNET: Spite and Malice - A fast moving and addictive card game with an attitude. This card game with an attitude, is fast moving and addictive. 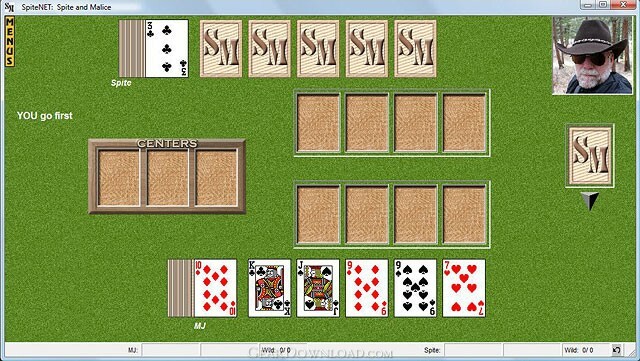 It's a form of competitive solitaire (patience), where you are challenged by the wit and skill of Spite, the resident computer opponent personality. It's a very old card game, also known as 'Cat and Mouse' and is similar to SkipBo. This Multiple Personality Edition can be played as a 2, 3 or 4 player game against entertaining computer personalities. Use standard picture playing cards or special easy to read cards. There are 3 computer skill levels and changeable rules. The game is fully customizable. Add-on personalities are available for registered users. Can also be played against anyone with an Internet or LAN connection. Quick start tutorial included. What's New: Updated User's Manual and price adjustment. Minor tweaks. This download (spiteset.zip) was tested thoroughly and was found 100% clean. Click "Report Spyware" link on the top if you found this software contains any form of malware, including but not limited to: spyware, viruses, trojans and backdoors. Spiteful Bank 4.0.0 - Spiteful Bank is an engaging and challenging double-solitaire card game. Red Dog 1.0 - A gambling game that depends a lot on luck, Red Dog is played just for fun. Black Jack 1.0 - This game by WorkHorse Games is a Vegas style Black Jack game. BlackJack Pro 2.2 - Master BlackJack in this thrilling card game. Many options and configurations. SolSuite Solitaire 16.0 - SolSuite Solitaire is a high-quality collection of solitaire games. Castle of Cards 1.1 - Build your own Eiffel Tower or Pyramid of Heops using just ordinary cards!